Tech Tales from the Trenches | Success stories of effective teaching utilizing technology. Success stories of effective teaching utilizing technology. 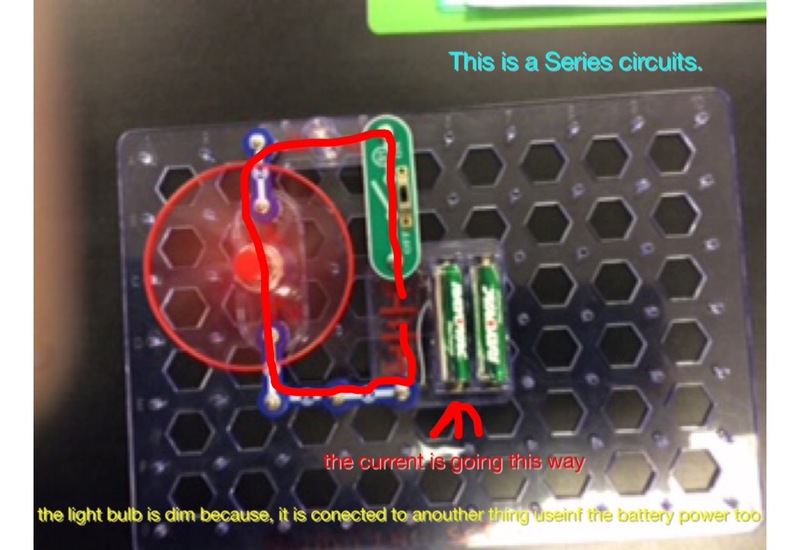 One of our 8th grade science teachers, Mr. Steve Hersh, recently shared a successful lesson that he prepared for his science classes to wrap up the topic of electrical circuits. This lesson followed several labs where students used Snap Circuit kits provided by Gettysburg College’s Advancing Science Program. In these labs, students had built several types of circuits and made observations on the differences between series and parallel circuits. His students then used their classroom iPads to complete some content reading, review content using video, and constructing a response comparing series and parallel circuits. The students started out with reading for content from KS3 Bitesize. After answering a few questions from the reading, which basically served as notes from the reading section, the students viewed a video on series and parallel circuits. Once these two items were completed, it was time for the students to show what they know. Save each picture into your camera roll. Use the app Skitch or 30 Hands to draw on each picture. Put your name on each picture. 1. Label each picture either series circuit or parallel circuit. 2. Trace the path of electricity in each circuit. 3. Briefly explain why the bulb is either dim or bright. 4. Save the annotated pictures into your camera roll. Upload the picture to dropbox. Delete the pictures from your camera roll. 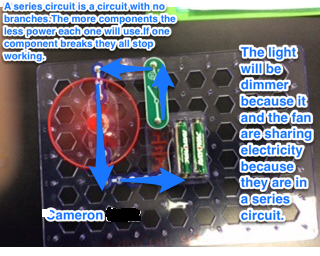 Student uses Skitch app to explain a series circuit. 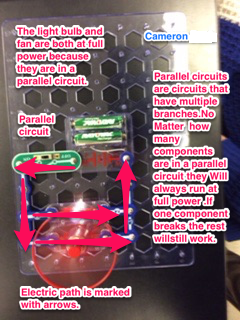 Student uses Skitch app to explain a parallel circuit. While this submission is a bit rough, the main idea of the response is correct. Students sometimes have a hard time applying the concepts they learn in science to the observations they make during science labs. Many times, this is because they are learning abstract concepts and are asked to apply these concepts to models, diagrams, and actual observations. 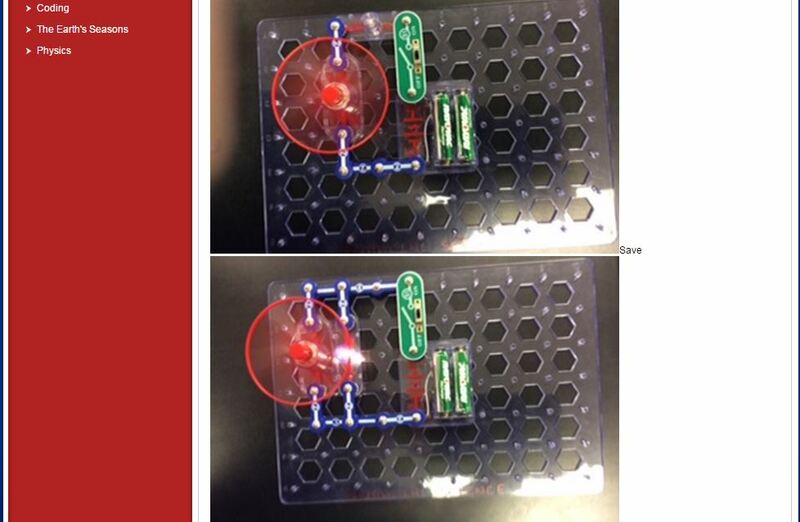 In the example above, the pictures that students were asked to label and annotate were circuits built with the Snap Circuit Kits, the exact same kits they had worked with previously for several days. They do not have to try to decode a diagram like the one below. So the X’s are lights, which part is the battery? What’s the question I’m answering? This would help the students to more readily apply their observations from those lab activities to the task at hand since they are working in familiar territory, and will help them to understand how several concepts work together. The student at the front of the room is working on a self check quiz on atomic theory. If he scores high enough, he will then explore properties of elements, just like the student behind him. 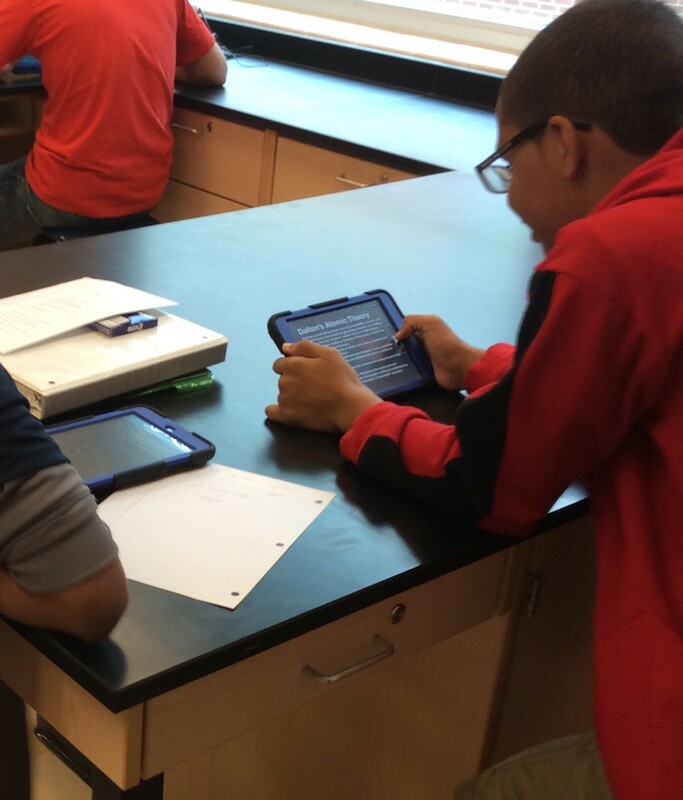 One of the classrooms in our device pilot is a 9th grade science classroom taught by Mr. Christian Ehrhart. Mr. Ehrhart manages and designs his instruction by the concepts of Mastery Learning. In a nutshell, students must meet the expectations for any assignment or assessment. If the expectations are not met, then the student will be given steps for remediation before attempting the assignment or assessment again. This process is repeated until the student has met the expectations. When you walk into Mr. Ehrhart’s classroom, you will observe students working on 4 or 5 different assignments, depending on what the students have mastered so far. This type of instruction requires the teacher to constantly monitor and interact with each and every student. A Moodle site and iPad cart have enabled the students to get immediate feedback on assessments, access resources, and build meaning and understanding utilizing certain subject apps. 1. Socrative quiz – Students who did not score a 75% or better on the assessment for the motion unit had to remediate to prepare to retake the assessment. Some students needed one day, others needed several days until they were ready to retake the assessment. Students would check with Mr. Ehrhart to show that they were ready to retake the quiz and would then complete the assessment using Socrative. When the students passed the assessment, they would then log into the Moodle site to complete the Introduction to Matter activities. Moodle page displaying the activities for the students to complete. View the following interactives at the links below. Make sure to Mark Two Atoms when you run the model. While observing each model, compare the movement of each model and how the Marked Atoms behave in each model. Record your observations in your notes. Molecular Workbench simulation showing the particle movement in a gas. Read through the history. Take notes on the main points. You will use your notes to take a practice quiz within Moodle on the history of the Atomic Theory. 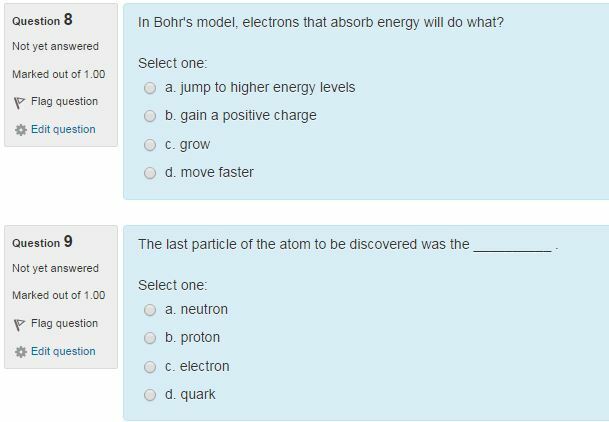 When you are finished reading and taking notes, go back to the main page of the Moodle course and complete the Atomic Theory Quiz. Sample questions from the self quiz for Atomic Theory. Students were given immediate feedback when they submitted the quiz. Many students tried the quiz again to get a higher score. The Build an Atom activity in the NOVA Elements app. Carbon is a very unique element. Why is Carbon so special? How is Carbon different from Nitrogen, it’s neighbor on the Periodic Table? Building a molecule of Fructose in the NOVA Elements app. Where does each element tend to be located in a biological molecule? What kinds of bonds can each element make? What similarities do you notice in the structures of the 4 molecules you built? Students were working hard and the entire class had a high level of engagement. Since Mr. Ehrhart has effectively relayed to the class that sub par work is unacceptable, the majority of the students strive to fully understand the content. Throughout the lesson, students would record their own notes as they worked with the new concepts presented by the activities. Many times students were observed seeking clarification of ideas by asking their peers and consulting additional resources such as websites, notes, and the digital textbook on the iPads. When taking the review quizzes, students would consult their notes to help them achieve a high score. By having the iPads available in the classroom, the students were able to access a variety of resources effectively and efficiently. The interactive nature of the NOVA Elements app and Next Generation Molecular Workbench allowed students to construct understanding of abstract science concepts. The Moodle site provides an organized structure for the multiple activities and resources utilized in the lesson. The students and teacher could assess learning using Socrative and Moodle, giving instant feedback on understanding and comprehension. This feedback was then used to determine if the student would move on to the next activity, or if remediation was necessary. The iPads made it much easier for students to be self guided and engaged in their learning, due to the expectations and structure provided by the teacher. A new school year is underway and our district will have a lot of exciting things happening this year. Several classrooms will be provided with a classroom cart of iPad minis or Google Chromebooks. This will give us a chance to see which devices will work the most effectively with instruction in different subject areas and grade levels. Recording video of water run off lab. Videos were uploaded to DropBox so that the teacher could share examples the next day from different lab groups. My focus will be working with our classrooms in grades 7-12 involved with this initiative. All six of our science teachers at the Middle School and one classroom at the High School will have an iPad mini cart. Google Chromebooks will be deployed in a 7th grade English class and a High School Physics / Chemistry classroom. Things are going well after the first month of school. The iPads have taken a little bit more to set up and configure before deployment, since we are using the Apple Configurator along with the LightSpeed MDM for managing the devices. Our teachers and students are getting their feet wet as they begin integrating these devices with their instruction. Using Quizlet to self check vocabulary. Accessing a customized digital text book created using the CK-12 Flexbook system, which aligns with our redesigned, multi-branch science curriculum in 7th and 8th grade. Students recording predictions for a lab on Watersheds and Soil Erosion. Socrative quizzes to check for student understanding during the opening or closing of a lesson. Posting and replying to discussion forums on Moodle. Creating brief audio presentations about properties of water and organism adaptations using the 30 Hands app. Exploring the basics of Biological chemistry using Moodle and the NOVA elements app. Using Google Drive to record daily learning journals and lab write ups. Recording observations from lab activities with photos or video. Increase student writing – All of our students have Google Apps accounts. Our students need to do more and more constructed responses using Google Docs on our devices. By having the responses in Google Drive, the responses can be easily shared and commented on by the teacher and can be viewed/reviewed by the student from any device with an internet connection. Biology students get an intro to 30 Hands app for creating student tutorials. with the device at the same time. We need to use the technology as an efficient way to differentiate for our students in the classroom so that all students are being challenged all the time. This will require planning lessons that have 3 or 4 different routes for the students to reach the objectives. Assessment and feedback – There are many ways to check for student understanding using the iPads and Chromebooks. 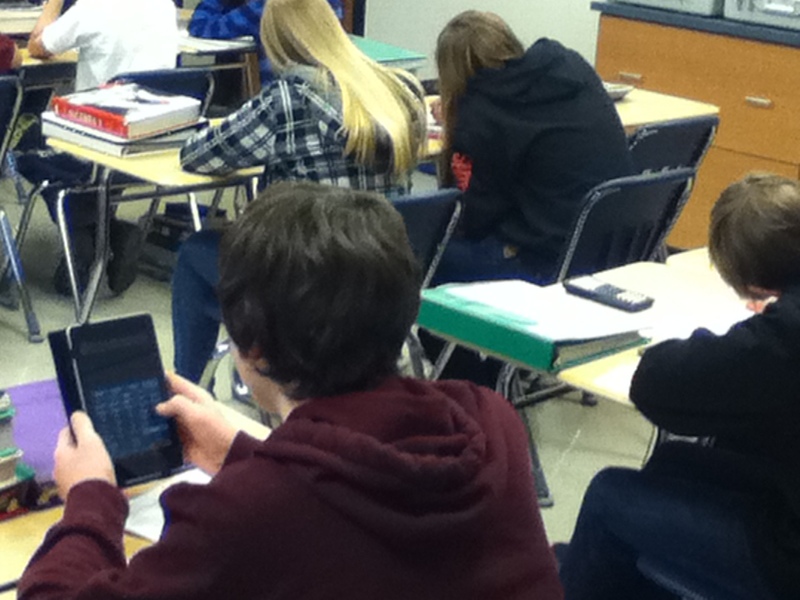 Several teachers are using Socrative for students to answer several questions during the lesson closure. Socrative can give instant feedback to the students when they answer a question, and the teacher gets a report detailing what the class answered correctly and incorrectly. These results can be used to modify the lesson for the next day, addressing any areas that the class did not grasp well. Using Google apps for Student Journals would also help students keep a running record of their learning and practice their writing skills. The teacher could view the journals, give feedback, and even share well written sections with the rest of the class. Using 30 Hands app to record audio. The next day, the students listened to each other’s presentations to learn about various organisms. Graphing functions in Algebra class is a task that has long been dominated by the use of a TI graphing calculator. But now, in a Bring Your Own Device classroom, students can work with these function graphs using an iPhone, iPod, or Android phone/tablet. Oh, and they can still use the good old graphing calculator too. Here is the lesson we had just done with several of our Algebra classes using multiple devices for graphing absolute value functions. The lesson was completed in one – 60 minute class period. The Algebra teachers who planned the lesson, Andy Elder and Cheryl Hoffman, are the same teachers who have been using iPods in the classroom for several other activities, including QR codes and student review videos. Since our school has a BYOD policy, the students were encouraged to bring their own device to use, if they had one. The classes were told that we would also have a set of 30 school iPod Touches available for use. 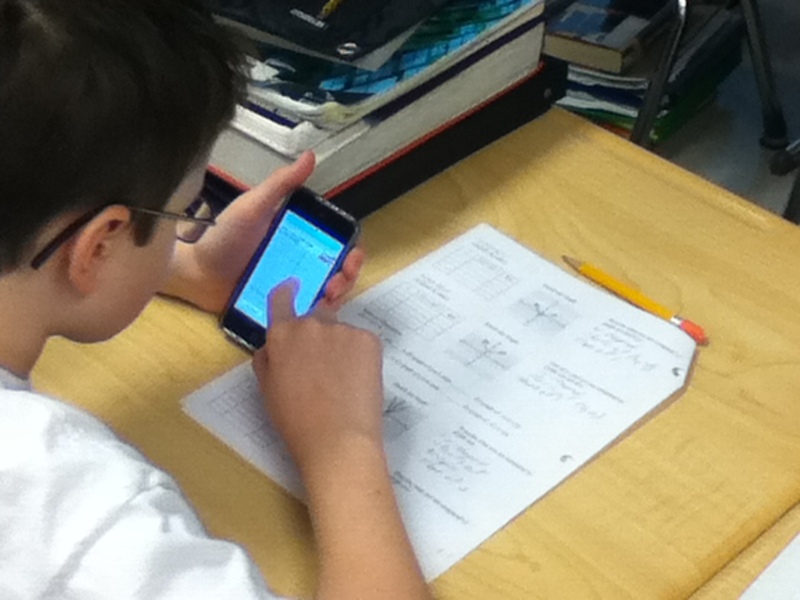 The students were informed that if they used their own device they would need a graphing calculator app. For the iOS users, we told them to install the free app Meta Calculator. The Android users downloaded the free app Graphing Calculator . A few students used their own Texas Instruments graphing calculator. Students were given a handout with the equations and graph grids. The first graph was created by hand, as the teacher led the class in completing the table of values, sketched the graph, and described the function line ( stating the position of the vertex in regards to the origin, direction of the line ). 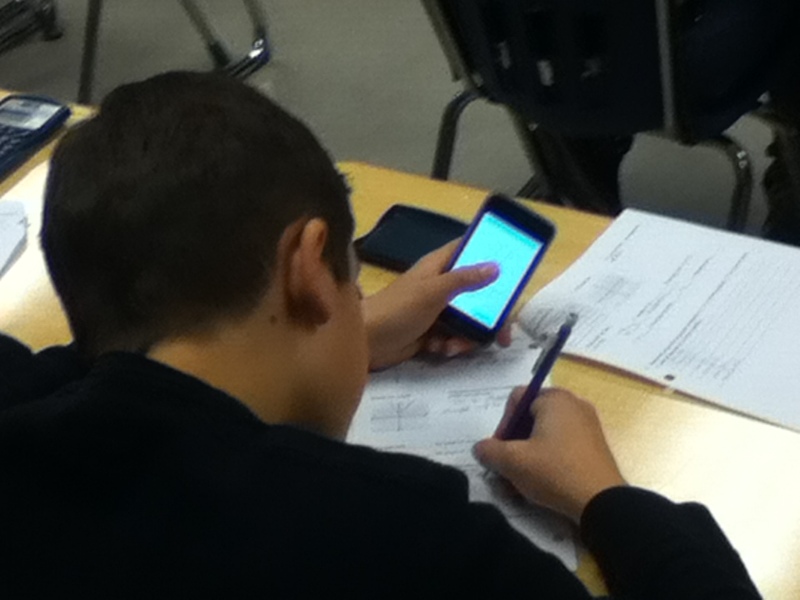 Once the graph was done by hand, the students then used their device to graph the function. 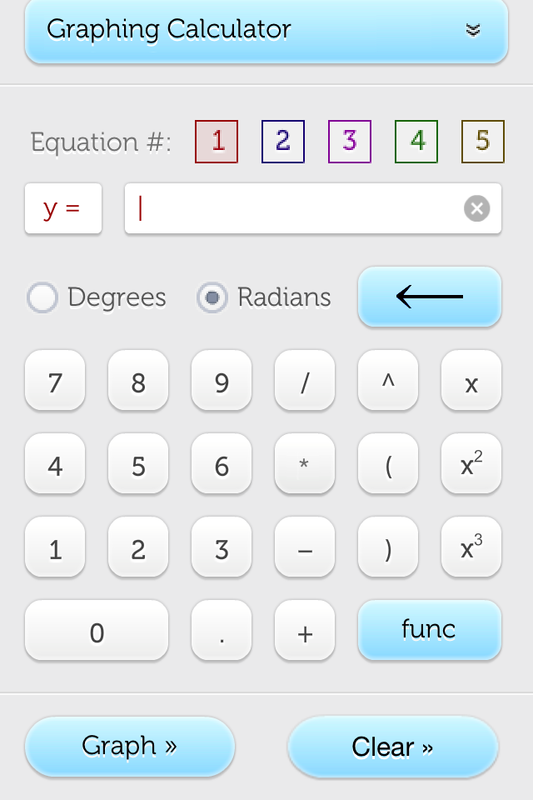 We projected screenshots for the app Meta Calculator, leading the students on how to input the equation for the graph. While not every single student was using the same type of app, we found that the screenshots helped the Android users as well, since the apps were so similar. After the students were able to recreate the first graph on their device, they proceeded through the handout graphing, sketching, and describing the shape of each equation graph. The students also had a section at the end where they had to record their prediction for the shape of the graph of 9 different equations and then verify the appearance with their device. The lesson demonstrated how, in a BYOD classroom, it does not matter what the tech tool is that you use. Students had to create a graph of an equation – it did not matter if they used a Kindle Fire, iPhone, or HTC phone to do so. The use of the tech tool was not the center of the lesson – the technology simply allowed students to focus on the concepts of absolute value, functions, and graphing. Students could spend more time determining the cause and effect relationship between the function equation and the shape of the graph, and less time on the lower level task of constructing each graph by hand. We also observed several students experimenting by inputting their own equations – to see what would happen to the graph. This experimentation will help those students develop deeper understanding of the concepts from the lesson. The closure for the lesson indicated a high amount of comprehension of the objectives from the class. Both Mr. Elder and Mrs. Hoffman were pleased with the results and thought it was an effective lesson . things like credits, background music, transitions, time limit , etc. Stay focused on the objectives of your unit or lesson. Having a sample video to show the students gives them a concrete example of what the rubric is targeting and will help your students get a good start on their planning. preparation component at least 25% of the overall project grade. Without limits, students will want to record outside the building, in the auditorium, in a moving car, etc. 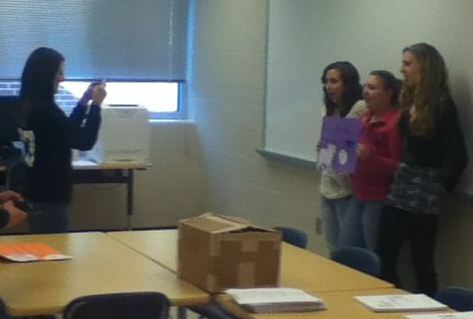 A video project should also not give your students the right to roam the halls, interrupting other classes. Tell them where they can go to record. Let students know up front who they can have in their video. Talk to students about the need to ask someone for permission before recording them. Wednesday“. Setting deadlines and sticking to them will help keep your students on task. Ecology class I worked with, groups worked on making videos about composting. go along with the content of their video. While one person in the group edited the video, the other two students created the poster. 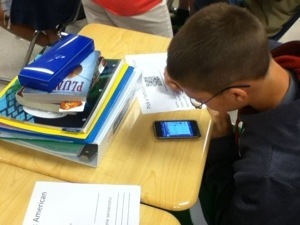 Using QR codes in the classroom is a very popular tech tool right now. One of the most common ways these codes are being used is to have a QR code scavenger hunt. Armed with a mobile device connected to the Internet, students are sent out around the classroom or school building to search for these squared off codes, as they answer questions on the topic being studied in class. Having been fortunate enough to assist various teachers with this type of activity, I have been able to observe some components that lead to an effective QR code hunt. Students find a code, scan it, and are greeted by a sentence of text asking them a simple question. While it may seem novel to use the QR code for this type of thing, the reality is that the technology is not necessary. The question could have been simply written on an index card and would have achieved the same purpose. Instead, take advantage of the QR code linking students to content online. Link to websites or videos for students to research with. Record audio and upload it to Dropbox , then make a QR code that allows students to listen to the audio file. We recently made a Google Spreadsheet on vocabulary for a unit, with the share settings toggled to anyone with the link can edit. When students scanned the code, they were taken to the spreadsheet and were able to submit definitions into the spreadsheet. Avoid saying to students, ” search the entire building! ” This will not endear you to your peers. You do not want your students to be distracting other classes. Remember that students will be using mobile devices that have a camera, which means that you will need to monitor them to make sure they do not start using the devices for recording video and photos. Consider how your class handles other activities in your room to help you determine how much of a range you can allow them to hunt. Even if it is a piece of notebook paper that you ask students to number #1-10, make sure students have something to record their answers and track their progress on. Number your QR codes as well so that students know where to place each answer on their sheet. A lot of times, instead of hunting for a code, students will just look for where their classmates are to find the codes. While this in itself is not a big deal, the problem is when some of your students take it a step further and do not bother with answering the question for themselves. They will simply ask someone else for the answer, without looking at the website you have linked for them. Avoid having a giant pack of students at one spot by separating or staggering your students. Give students different starting points for the hunt, or stagger when students begin the hunt. In a recent class I was in , students could not start the hunt until they orally answered three review questions to the teacher. QR codes are popular because of BYOD and other school initiatives which allow smart phones and other handheld devices to be used in the classroom. As the classroom teacher, you must keep in mind that not every student has a device of their own. How will you handle this without singling out these students? At our Middle and High School, we are able to supplement student devices with school iPods. Students can use their own device or may sign out one of our school iPods. If you can not supplement, is it possible to make up groups so that every group has access to a mobile device ( with a camera ) ? If you can not have enough devices available, then the activity will not work. As our district prepares for 2 days of in-service, one of our small sessions teachers can select to attend is on our district Google Apps platform. I wanted to take the time with this blog entry to point out the reasons for using a school provided Google Apps account as opposed to a personal account. Kind of a no-brainer but it’s one that as a teacher you really want to make sure that you do. Not only will this help you to stay more organized, but it will also help you to not share too much with your students. For example, your Google account is used for YouTube and Picasa Web Albums. Do you want your own personal play lists for YouTube to be intermixed with the playlists you use in the classroom? If you upload videos to YouTube, it is much better to have the videos you make for the classroom separate from the videos of your pet kitten jumping at the Christmas Tree. If your school has contact sharing enabled (our school district does), then your Google account is added to an address book for all users with a Google account in your school. When students or other teachers go to share a document with you, they will type your name in the share window. As they type, your name will auto fill in the box. They can simply click on your name and share the document. If you use a personal account that is not going to happen. Users would have to type in your exact username or gmail address. One little typo or mistake and you will not see that document. Google Apps for Education provides other services that can be activated for a school district. This allows users to have multiple applications in one location, with one log in. 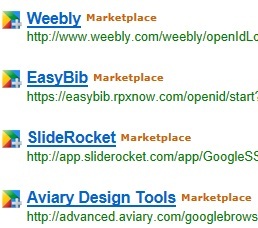 Our district has activated Weebly (website creation) , Easy Bib (citation tool) , and Aviary (photo editor) as some of the additional applications that are usable with our school Google accounts. In summary, if your school district provides Google Apps for Education accounts, take advantage of it. Use that account for all of your school related needs. It will be easier for you to organize and share your professional documents, and it may allow you to access other resources more conveniently.